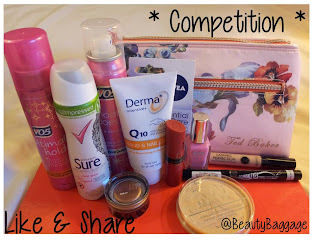 *COMPETITION* - Win a Ted Baker Make Up Bag full of Goodies! This competition is open for the month of September! To be in with a chance of winning everything you see (worth over €70), please like Beauty Baggage on Facebook (and share the competition photo) and follow Beauty Baggage on Twitter (and re-tweet the competition photo). At the end of the month a winner will be chosen at random from all the shares and retweets (the more you share, the more chances you have of winning).